SKU: PacDrive. Category: Keyboard Encoders and Interface Hardware. Low-cost driver board for devices such as LEDs, solenoids, lamps etc. Ideal for use with illuminated pushbuttons. When used with the MALA front-end, the easiest way to control pushbutton illumination in your panel. Will drive up to 16 standard LEDs with no additional power. Up to 4 boards can be used (more by request). Different IDs available. 500mA total current without external power supply. Higher current draw will require additional power. 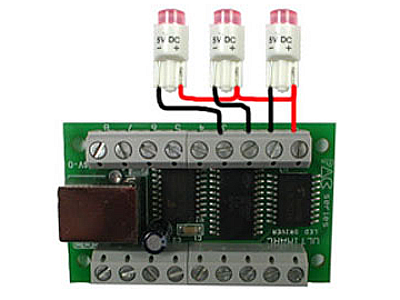 5 volt outputs without external power supply. 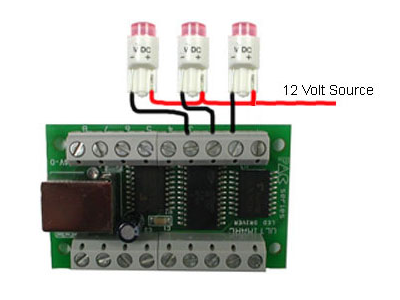 Up to 48 volt outputs with external power supply. Open-Source software. No driver required. 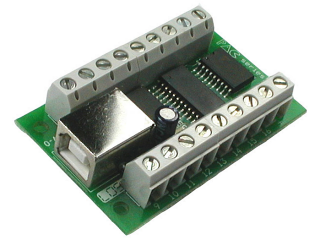 Support as a LED driver for several MAME front-ends soon.